CLASSIC AND SIMPLE DESIGN: No cumbersome lines and luxurious elements, colliding with each other through simple and bright colors, telling a story about a warm home. Simple design is always loved. The slippers can be given as a gift to anyone you love, Which will melt their heart whenever their look down at their feet. 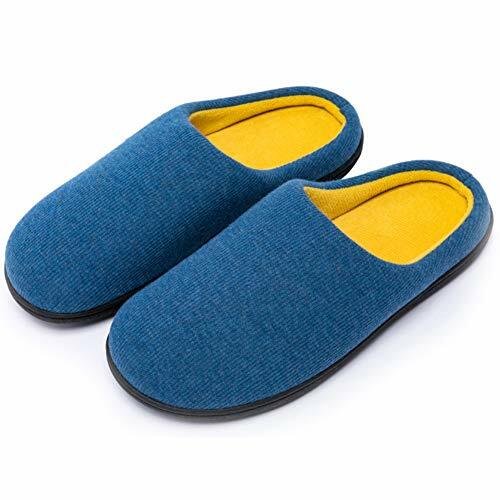 PLUSH LINING & MEMORY FOAM INSOLE: The memory foam insole makes these slippers soft and flexible. 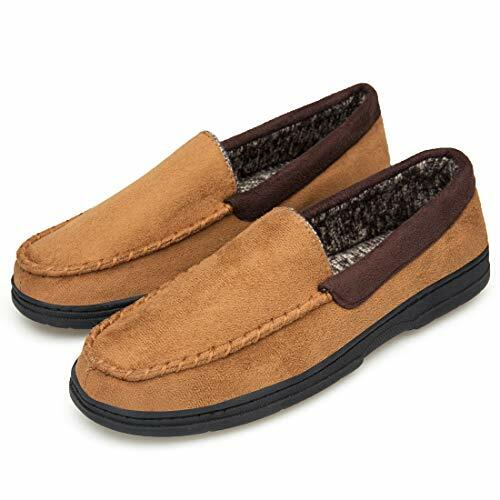 Comfortably treat your feet to our plush memory foam footbed after all-day standing or walking. The slippers are selected from the quality plush lining, filtered out uneven color, soft and skin-friendly, make sure your feet stay dry and odorless, which will keeps your feet nice and toasty whether in socks or bare feet. SUPERIOR & ANTI-SKID RUBBER SOLE: The sole is ergonomically designed to provide foot support and fit to the curve of the foot. The weight of the body is evenly distributed to relieve the pressure on the foot and make it more comfortable to wear. 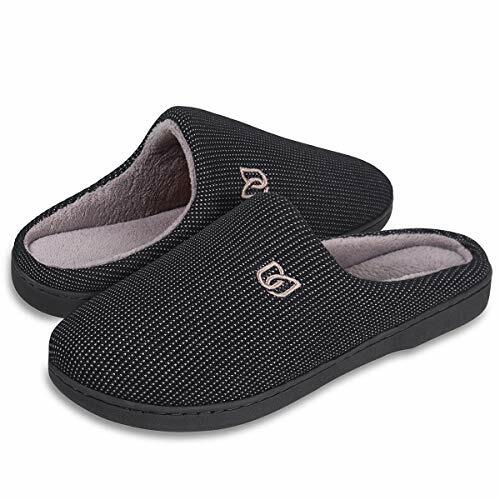 The wavy pattern of the sole has a non-slip function, making the slippers perfect for indoor and outdoor use. Each of your steps will become more steadier. MULTIPLE OPTIONS & EASY MAINTENANCE: Easy to Slip on. Available in sizes Small, Medium, Large and X-Large; Available in your choice of Dark Blue, Gray and Black. 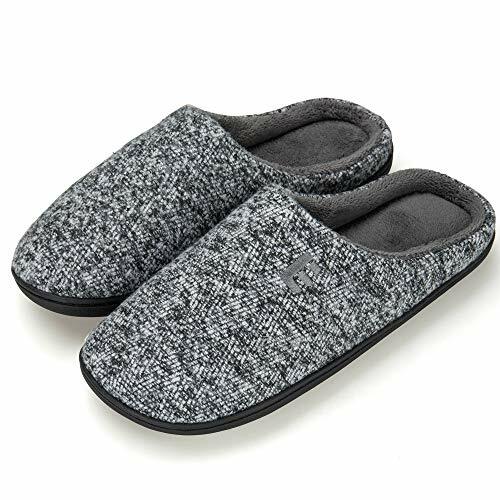 These stylish slippers fit most standard men's foot sizes. They are both hand and machine washable. SATISFACTION GUARANTEE: With Watelves, you're taking no risk with your purchase. We offer 100% no risk money-back guarantee if you're not thrilled with your purchase for any reason. Just tell us and we will do our best to give you the most satisfactory solution. 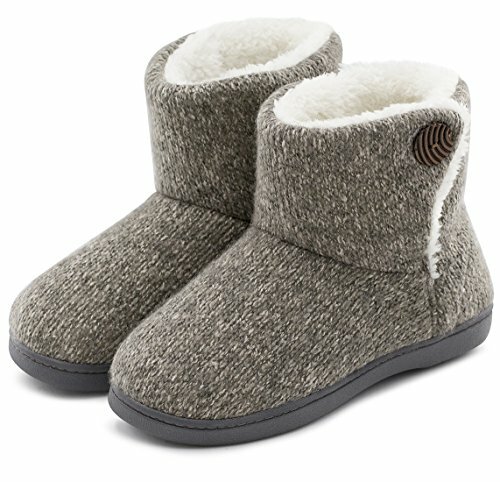 Please check our Watelves storefront for more slipper styles and other winter boots that are waiting for you! 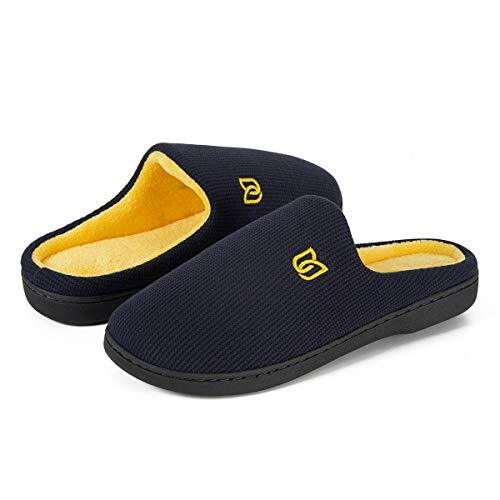 PLUSH LINING&MEMORY FOAM INSOLE: The memory foam insole makes these slippers soft and flexible. Comfortably treat your feet to our plush memory foam footbed after all-day standing or walking. The slippers are selected from the quality plush lining, filtered out uneven color, soft and skin-friendly, make sure your feet stay dry and odorless, which will keeps your feet nice and toasty whether in socks or bare feet. 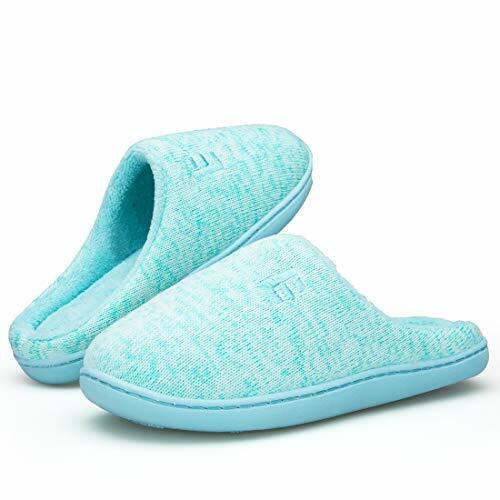 ULTIMATE COMFORT：The instep is made of high-quality fabric, natural skin-friendly; The inner lining uses soft short plush,breathable and comfortable; The insole uses memory foam to effectively relieve foot pressure; which makes you feel like you're walking on a soft cotton. 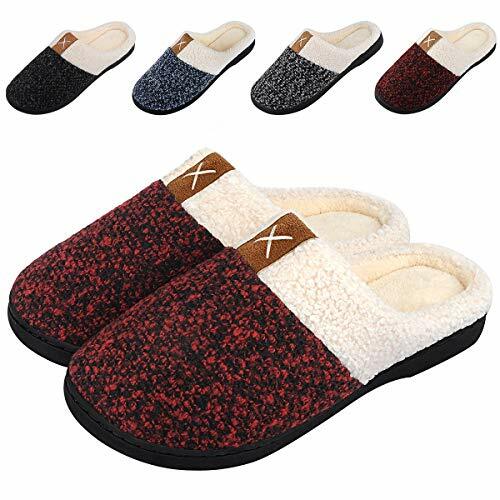 WARM & COZY HOUSE SLIPPERS - Knitted cotton upper and terry lining keep feet warm and cozy in Autumn and Winter. Thicker memory foam insole mold to your feet. Soft sponge provides superior comfort. 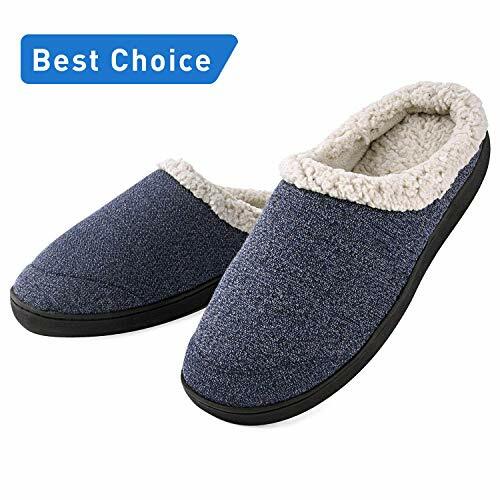 COMFORT PLUSH FLEECE UPPER - Comfortable microfiber upper and wool-like plush fleece lining covers the inside of the winter slippers that make sure enough temperature to take care of your feet and offer cozy and toasty experience on your feet. 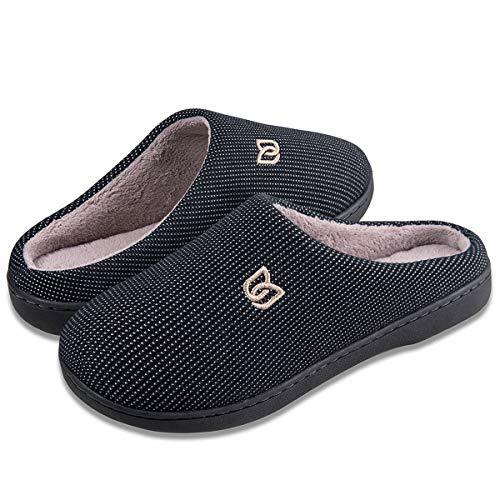 It is more comfortable and soft to wear than traditional slippers. Slide your feet into our coral velvet slippers and enjoy a new slipper wearing experience. 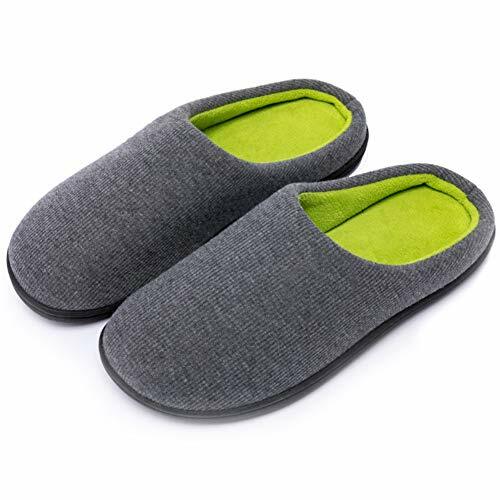 PLUSH LINING & MEMORY FOAM INSOLE: The memory foam insole makes these slippers soft and flexible. Comfortably treat your feet to our plush memory foam footbed after all-day standing or walking. 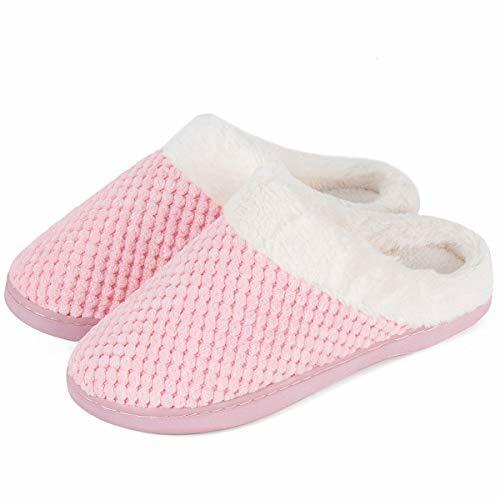 They offers lasting marshmallow-like comfort and warmth for tired toes and heels, reduces muscle fatigue, relieves pain and pressure after a long day hard work. MULTIPLE OPTIONS & EASY MAINTENANCE: Easy to Slip on. Available in sizes Small, Medium, Large and X-Large; Available in your choice of Royal Blue, Red and Black. 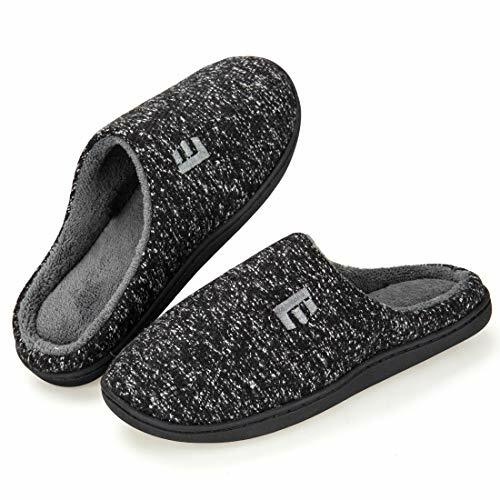 ese slippers are the perfect shoes for women of all ages and all season. Also great gift for the comfy cozy fan. They are both hand and machine washable. 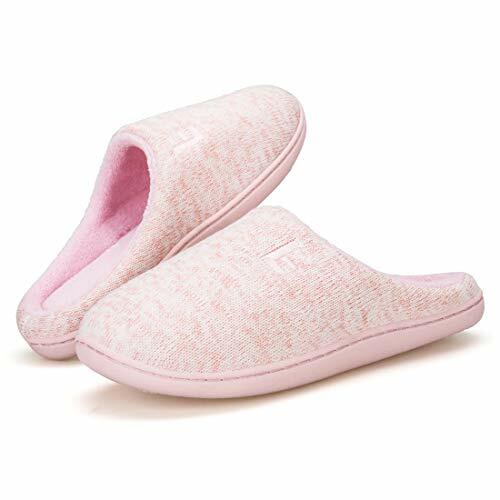 WARM & SO CUTE: Our slippers made of Comfortable coral fleece upper and ultra-soft coral plush lining, soft and comfortable, make sure your feet stay dry and odorless. 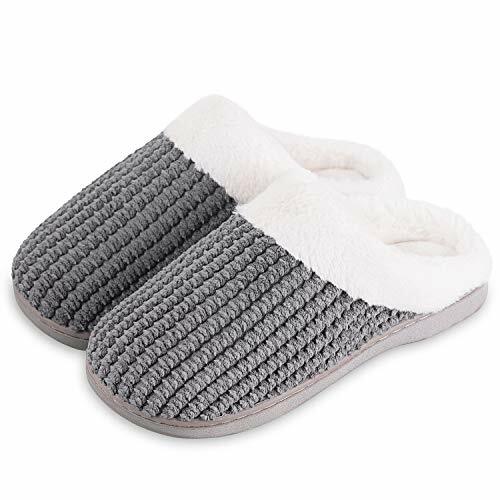 The knit upper and cozy coral fleece upper add elegant, luxurious and delicate touch to these slippers. This a really cute and nice looking style that you can even wear them outdoor. MULTIPLE OPTIONS & EASY MAINTENANCE: Easy to Slip on. Available in sizes Small, Medium, Large and X-Large; Available in your choice of Blue, Grey, Pink and Green. 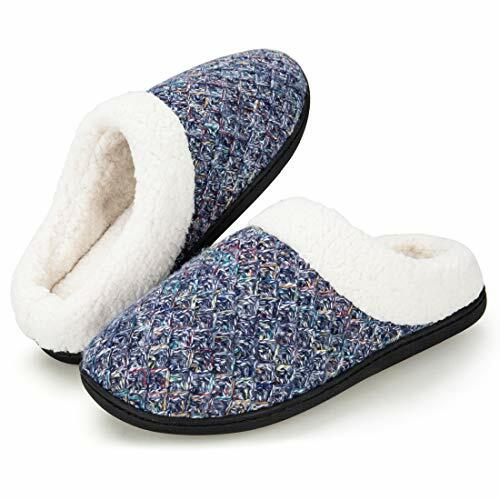 These slippers are the perfect shoes for women of all ages and all season. Also great gift for the comfy cozy fan. They are both hand and machine washable. 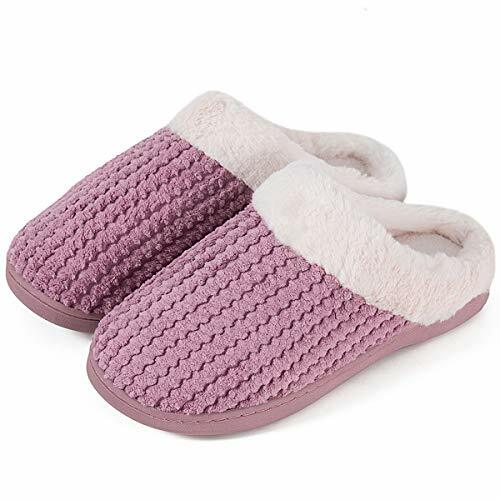 SOFT WOOLEN YARN KNITTED UPPER: Along with the breathable cable knit design, the woolen yarn material really offers a soothing comfort but not making your feet gain much moisture. TOASTY & CUSHY LINING: Warmth is always the key to your cold feet in winter. 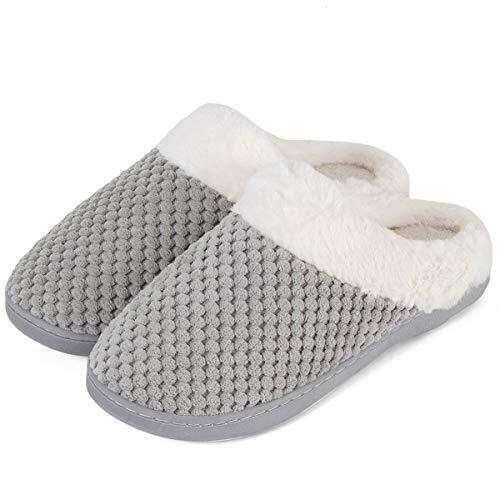 Sliding into these slip-on bootie slippers, with cozy fur up well past your ankles, you will be addicted to the coziness and skin-friendly plush lining with barefoot or feet with socks. 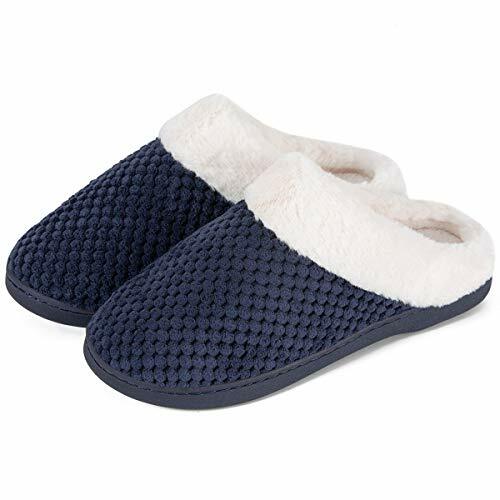 THICKENING & HIGH-DENSITY CUSHIONING: These bootie slippers are lined with high-density padded memory foam that really cradle your feet and retains the shape. Extra three layers thickening foam cushioning make each of your steps like walking on the pillows or a top mattress. STYLES & COLOR OPTIONS: Available in your choice of Gray, Purple & Navy Blue. 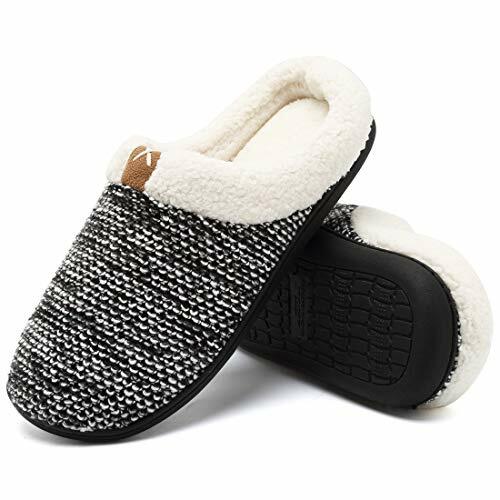 As to these bootie slippers, we also have woolen yarn cable knitted slip-on slippers in our store. Just click our brand name to choose your favorite ones. Constructed with meticulous yarn knit upper and high density cushioning, these slippers may feel a bit snug at first and then they will stretch a little to a customized fit after several wearing. SIMPLE & SCIENTIFIC DESIGN：Anti slip rubber outsole makes each step noiselessly in the house. Breathable Lining can wick away perspiration quickly. 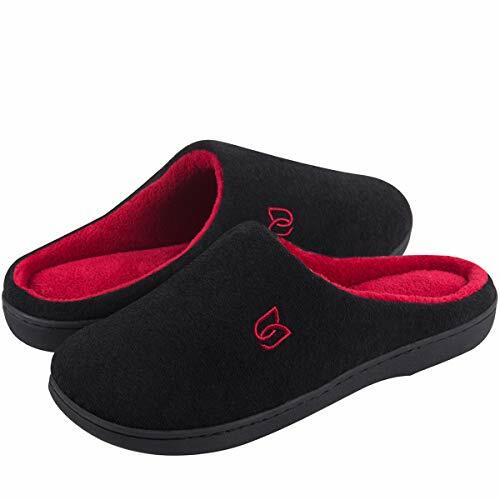 The Men's Comfy House Shoes design for all your need at home. SINCERE & PATIENT SERVICE - We offer 100% money-back guarantee if you receive defective products. Just tell us and we'll give you the most satisfactory solutions. Any questions can consult us. 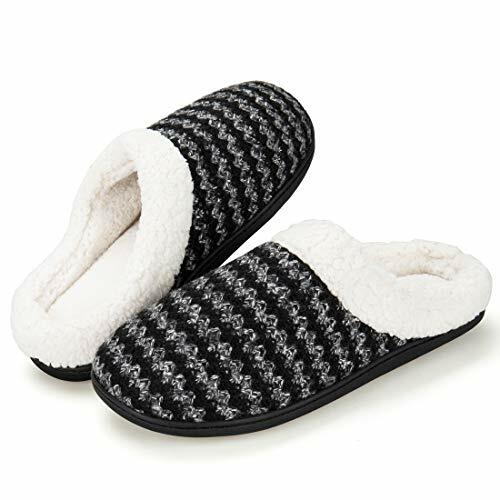 STYLES & COLOR OPTIONS: This stylish slipper is also designed for women with different colors. Just click our brand name and enter into the store to get a pair for your loved ones. Standard including wide foot sizes fit well. 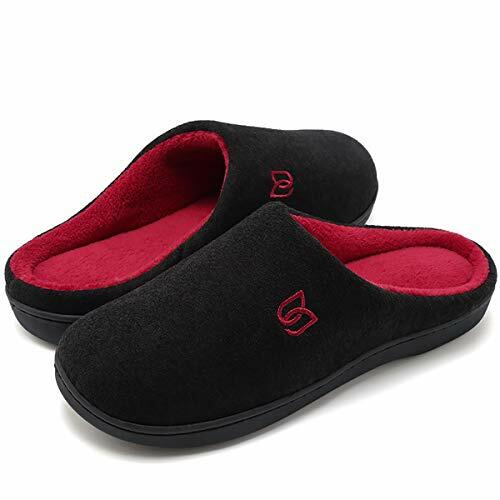 Material -The cute slippers are made of high quality soft velvet. 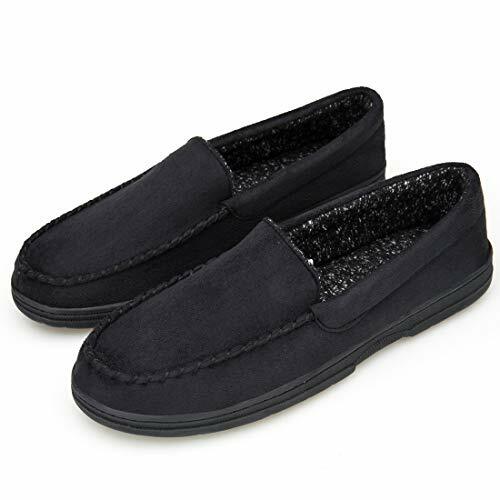 Easy slip-on slippers. Featuring ultra skin-friendly, lightweight, and extremely comfortable to wear. 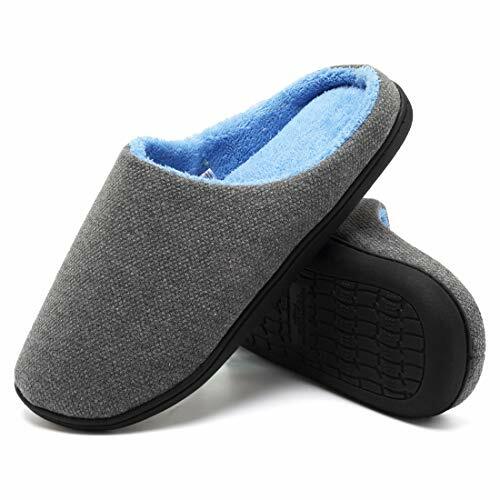 High Density Memory Foam Insole - The high density foam insole not only make your kids feel like walking on a cloud,but also molds to your kid's feet and retains the shape. 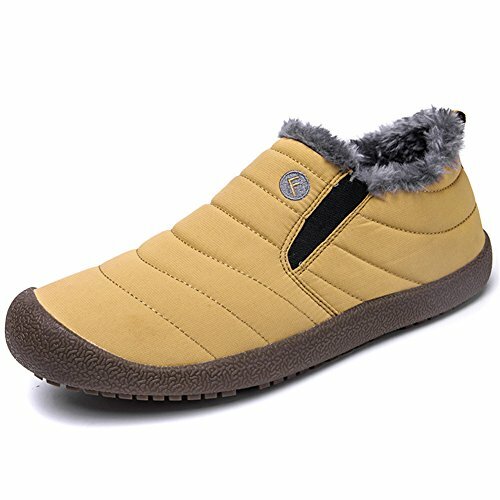 Anti-Skid Sole - Environmental friendly and waterproof rubber sole,offering your kid an anti-skid protection.Each of your kid's step will become steadier with slip-resistant texture on the bottom. 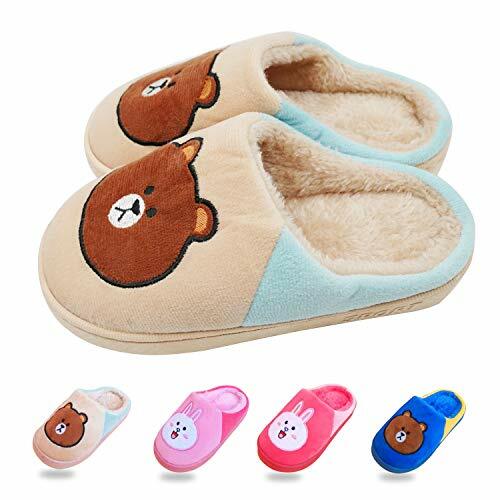 Perfect indoor kids slippers. Cute Design - Your kids will love the lovely cute design. 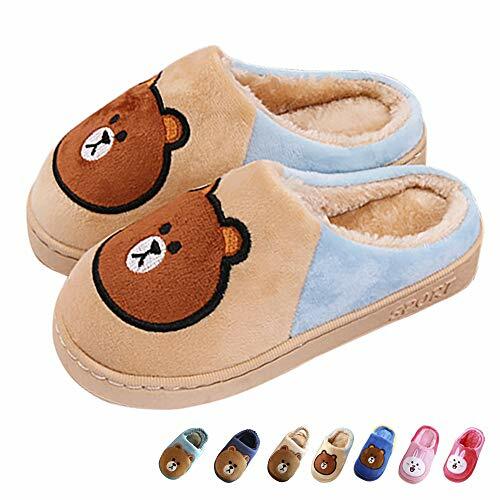 Cute bunny and bear animal design makes these slippers an awesome Christmas or Birthday gift for your child. Warranty - 1 years warranty and 2 month money back guarantee. The responsible Namektch team is ready to assist you all the way. Thanks for your support. 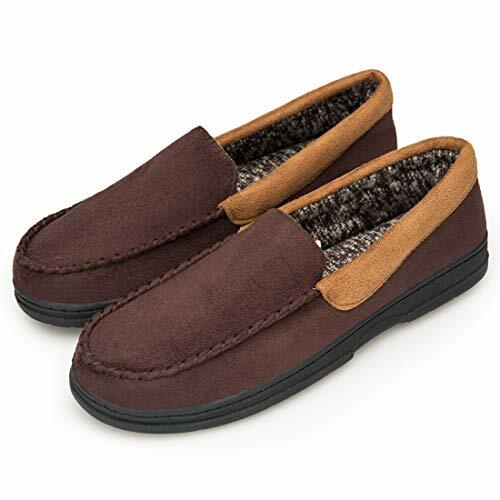 High-Density Memory Foam Insole: The completely improved insole is constructed with three layers of high-density memory foam which makes you feel like you're walking on a soft cloud and bring a soft and relaxing feel to your feet.while the meticulous wool-like knit upper will hold your feet in all the right places and retains the shape ,the slightly closed heel design really helps to keep your feet warm. 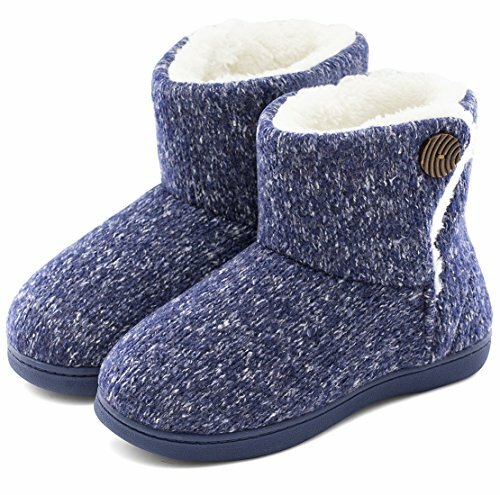 【ULTRA COMFORT SOFT WOOL-LIKE LINING】：The exquisite upper and plush lining make for stylish and comfort wear, keep your feet warm and comfortable everyday. 【ANTI-SKID TPR SOLE】：The light-weight TPR sole makes the slippers perfect for indoor and outdoor use. Each of your steps will become steadier with slip-resistant texture on the bottom. 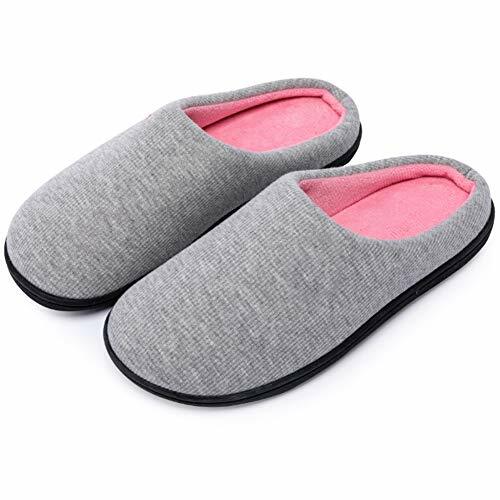 【ULTIMATE COMFORT MEMORY FOAM INSOLE】：Memory foam cushioned and supportive insole molds to the contours of your feet for a gentle fit and springy comfort. 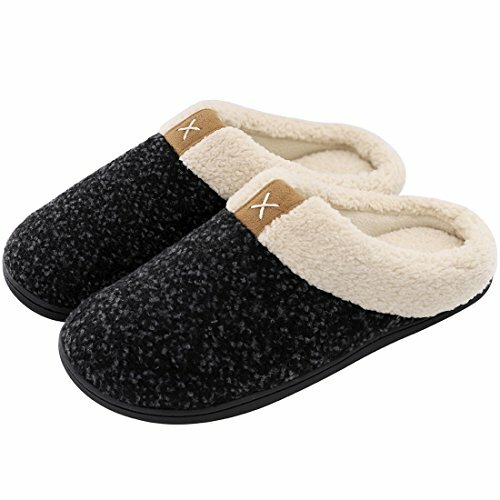 【COMFORTABLE AND WARM】：These slippers can be worn indoors to eliminate fatigue after a long day at work work or keep you company over a pleasant weekend. 【MULTI FUNCTION】：Suitable for wearing post-bath or spa, cooking in the kitchen, playing with your kids, drinking afternoon tea in the garden, walking to the mailbox, taking out the trash, watering the lawn, walking the dog, or going out to sign for parcels.